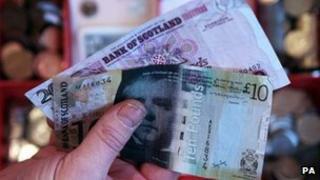 The Scottish government has announced £33m extra cash for housing, job programmes and roads. The additional money for 2011-12 has come from Westminster. Finance Secretary John Swinney said £12.9m would go on housing, £5m for employability programmes, £4.5m on roads and £5m on health. Both the Liberal Democrat Party and the Labour Party said Mr Swinney's decision making had represented a "missed opportunity". But Mr Swinney said the way he had allocated the cash showed his support for economic recovery. He added: "These Barnett consequentials will inject new support this financial year into housing, transport and employment programmes, helping get people into work, create new jobs, and meeting our ambitions for Scotland. "The Budget Bill for 2012-13 maintains that clear focus on investing in growth. Where will the extra money go? "I remain happy to consider proposals opposition parties wish to make as part of the bill process, where they match our priorities and where funding is fully identified. We will announce the outcomes of this process and the allocation of further Barnett consequentials for 2012-13 onwards in due course." The SNP administration had been considering how to spend £136.6m of additional money it has received for 2011-12 as a consequence of Westminster spending decisions. Just over £100m of that had already been allocated by the Scottish government. As well as the money for housing, jobs and roads, £2.5m will go to pay for claims from councils in the wake of damage caused by recent storms; £1.1m for cultural projects; £2m to support capital projects and £400,000 for Marine Scotland and National Parks. Scottish Labour described the SNP administration's housing cuts as a "missed opportunity". Elaine Murray, Scottish Labour housing spokesperson, believed greater spending would have created jobs and tackled fuel poverty. She added: "By restoring just a fraction of the housing budget, this is the equivalent of taking £20 from someone, handing them back a couple of pound and then asking them to be grateful. "The deep cuts to the housing budget represent a real missed opportunity to stimulate the economy, create jobs and tackle fuel poverty." Scottish Liberal Democrat leader Willie Rennie said he was disappointed the government had not handed some of the extra cash to help colleges. He added: "This is another missed opportunity to help save Scotland's colleges. The budget revision today shows that the Scottish government has received £136m of additional resources from the UK government in the current year alone. "Finance Secretary John Swinney should have been indicating today that he would be reversing his £40m cuts to colleges. There is no excuse to make the cuts now he has the extra money available." Housing Minister Keith Brown welcomed the additional cash for housing, with £10m to be invested in affordable homes, along with £2m for housing adaptations and 3900,000 for housing and regeneration programmes. Mr Brown said: "The supply of new affordable housing remains a high priority for the Scottish government. This is a challenging economic time for Scotland's housebuilding industry, so an additional £10m will support jobs in the sector whilst also stimulating the wider economy." Mr Brown said the funding "reinforces our commitment to deliver 30,000 affordable homes during this Parliament, of which at least two-thirds will be for social rent".